Beneath the Sea a compilation of spectacular underwater images from around the world. Captured in exclusively in 8K digital, Beneath the Sea features an award-winning original score by Alan Williams. Beneath the Sea a compilation of spectacular underwater images from around the world. 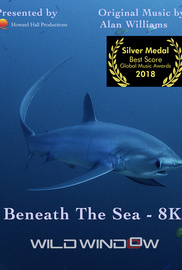 Captured in exclusively in 8K digital, Beneath the Sea features an award-winning original score by Alan Williams. Award of Excellence Best Original Score - Accolade Global Film Competition 2019. Silver Medal Best Score - Global Music Awards 2018.